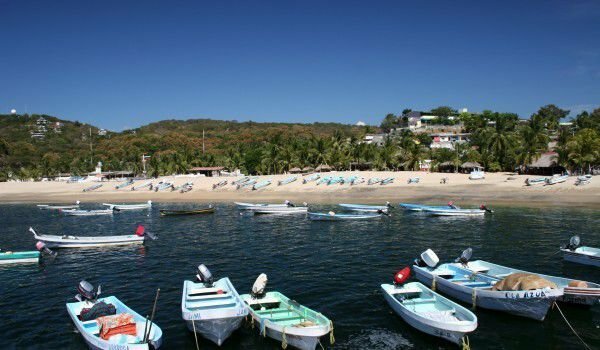 Located on the southern Pacific coast, this picturesque region is a mix of sunny beaches and traditional Mexican settlements. The average altitude there is 1500 m.
The beaches there are particularly attractive for tourists from around the world, because the water is crystal blue and the white sands are fine. There is a nudist beach Zicatela - perfect for surf and the bay of Puerto Escondido and Puerto Angel. Oaxaca and Chiapas has the largest Native American population than any region of Mexico. There are indigenous beliefs, traditions and manners coexist for centuries, which is another reason Oaxaca is a magnificent destination for lovers of foreign cultures. This area is the fifth largest province in Mexico by population and comprises about 3 and a half million inhabitants. The Central Valley of Oaxaca is one of the most fertile areas of North and South America because it was quickly settled. The first tribes that located on these lands in the 13th century were dominated by another tribe. These two tribes in a short time began to cultivate other crops such as maize, beans, cocoa, tomatoes, chili peppers, squash, avocados and pineapples, and then they began to breed animals. The main industry in the province, has over 250 km of beaches and therefore is tourism. The town of Oaxaca is decorated in colonial style, when it comes to its architecture. Many squares, narrow streets and courtyards offer many interesting places for viewing the temple of Santo Domingo, the Governmental Palace, home theater and several museums. High in the mountains lies the ancient religious complex of Monte Alban. This is an un-culture of the Mayan Palace in eastern Mexico. The center consists of beautiful buildings, squares and spaces for ritual ceremonies. Oaxaca is a place where there are year-round music festivals of various music sort. If you visit the city in early November you will become part of the festival, Muertos, All Souls' Day which will definitely be an experience. More information on the mayans.